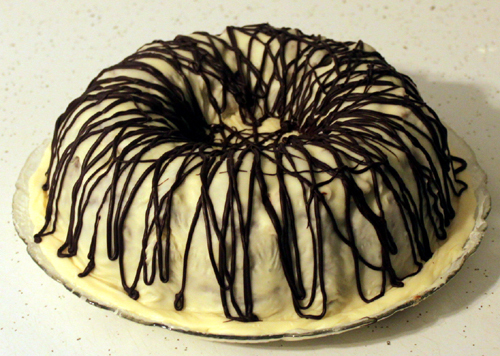 This cake is from an old recipe book....300 Ways To Use Your Bundt Pans. Such a fun recipe I couldn't resist trying it out. So very tasty. I didn't plan to do a chocolate drizzle, but the cake looked unfinished to me with just the white glaze. Mix 1/2 cup of the flour with the dates, orange slice pieces, and coconut and stir to coat. Set mixture aside. Cream together butter and sugar until fluffy. Mix in eggs. Add in vanilla, salt, and baking soda. Alternately add milk and remaining flour to batter. 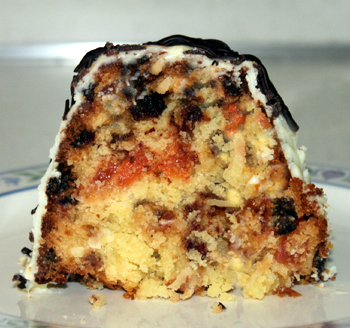 Fold in orange slice mixture. Pour batter into greased bundt pan and bake at 325 for 1 hour and 15 minutes or until cake tests done. Cool. Mix together sweetened condensed milk, white chocolate chips, and orange extract. Microwave, stirring often, until smooth and creamy. Spoon glaze over top of cooled cake. Chill to set the glaze. Melt dark chocolate chips. Spoon chocolate into ziplock bag with tip cut off. Drizzle chocolate over bundt in whatever pattern you prefer. Chill. The first slice of cake never comes out pretty.....and yet I took a picture of this slice anywho....ehehehe. Wow! It looks so yummy! Both inside and outside! Wow! looks super delicious! i am hungry :). I love the chocolate drizzle, you're right, it really does finish the cake! Oh my! I love the look of the slice. jewelled with oranges. Lovely looking cake! This looks sooo good! I bought a bag of orange slices a while back and didn't know what to do with them until now. Thank you. I love baking bundt cakes more than anything else and would love to have a copy of that book. Even if you weren't planning on the chocolate, I think it's the perfect addition. This makes me think of those chocolate oranges you get at Christmas. You know the ones you have to slam down on the ground to break apart? I am not normally a fan of oranges, but wow... The chocolate and that picture of the slice has me drooling over here. Congrats to you both and best wishes on the healthy arrival of your little one! The chocolate is a great last minute addition... I think the orange-chocolate combination is totally underrated! Oooooo... Congrats and good luck with your pregnancy! I was missing from the blogosphere for the same reason. You are going to love having a baby... They are so cute and cuddly...hehehe. Where did you go? You haven't posted in forever. Sometimes the old recipes are the surprisingly the best! This one looks and sounds divine!